A search engine is the first resource a person will use to find something he or she is interested in. Google processes well over 40K searches every second, so search engines play a significant role in how your target audience finds your business online. If your website isn’t optimized for search engines, your customers won’t be able to find you. A clear understanding of how search engines work and how you can optimize your website so it can rank for the right keywords is crucial. Search Engine Optimization (SEO) and Search Engine Marketing (SEM) refers to marketing strategies that focus on improving a website’s visibility in search engine results. SEO aims to improve rankings and drive traffic from search engines. On-page SEO refers to measures and techniques that are carried directly on the website in order to improve search engine ranking. For instance, HTML tags, URL, and other elements related to your website are pretty much in your control. So use that to your advantage. Off-page SEO refers to search engine marketing techniques and actions that take place outside of your website. Generally, you don’t have control of off-page SEO as you cannot control how people link to your website. Off-page optimization impacts search engine ranking more than any other SEO technique. Google uses well over 200 different ranking factors to rank websites in search engines. Most of these factors are off-page such as backlinks, referring domains, anchor text, and others. Backlinks are the most critical and most important ranking factor. Unfortunately, you cannot control how and when people link to your site. The best way to improve off-page SEO is to write content that is extremely helpful and is 10x better than the best-performing content out there so that people cannot resist linking to and talking about your awesome content. Technical SEO refers to actions that are taken to ensure search engines are able to find, crawl, and index your website. It involves techniques like sitemaps, robots.txt, crawlability, website structure, pagination, more. Since it involves certain technicalities, these are handled by experts during website development. 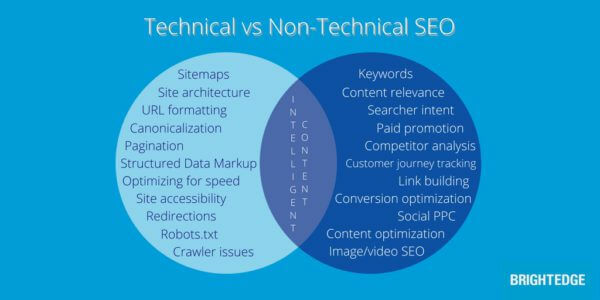 A slight error in technical SEO will ruin all your on-page and off-page SEO, so make sure you don’t ignore it. Now that you know the basics of SEO and SEM, it is time to get cracking. Want a free SEO analysis? Contact us to learn more.